The humorist wrote about Vietnam and the trappings of everyday life for The Saturday Evening Post. 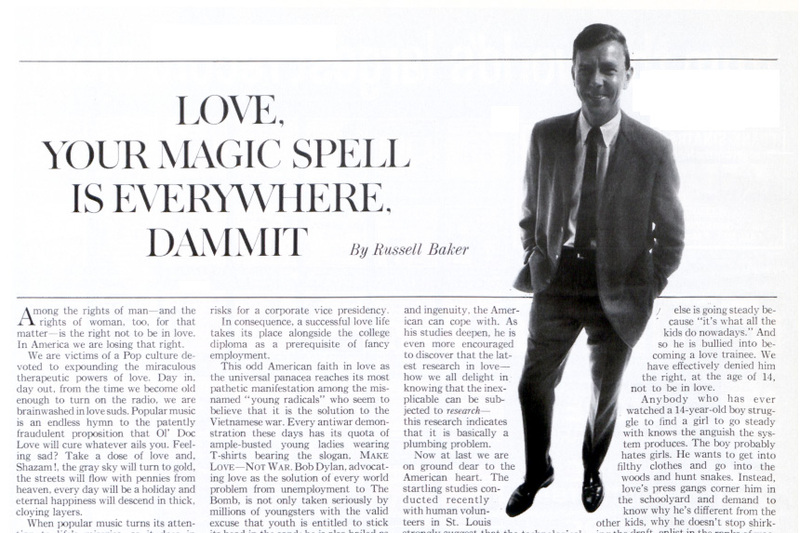 A titan of 20th-century humor, Russell Baker, has died at 93 years old. The winner of two Pulitzer Prizes and the writer of The New York Times’ nationally syndicated humor column Observer for more than 35 years, (not to mention the author of Growing Up and a host of PBS’s Masterpiece Theater), Baker built an editorial career that reported and commented on politics, culture, and beyond in many thousands of articles with numerous publications. Baker’s start as a reporter covering Washington, the White House, and Congress gave the writer ample perspective and disenchantment with the system to launch a legacy of satire. His thrice-weekly Times column in the ’60s coincided with Baker’s work in other national publications like Ladies’ Home Journal, McCall’s, and The Saturday Evening Post. Baker’s wry takes were ripe for The Human Comedy and Speaking Out sections of this magazine that dedicated space to laconic wit and out-there opinions of the time. In 1966, he wrote “The Man Who Beat the Rat Race” and “How the Vietnam Problem Was Neatly Solved, or…” for The Human Comedy pages. Baker’s balance of affect and absurdity tinged American life for decades and colored the culture with wit through the best and worst of times. A natural humorist with a sharp eye for hypocrisy and tedious trend, Baker will be missed for his bold voice that uncovered the farce in everyday affairs. Read “The Man Who Beat the Rat Race” by Russell Baker, published January 15, 1966. Become a subscriber to gain access to all of the issues of The Saturday Evening Post dating back to 1821. Read “How the Vietnam Problem Was Neatly Solved, or…” by Russell Baker, published July 30, 1966. Become a subscriber to gain access to all of the issues of The Saturday Evening Post dating back to 1821. Thanks for this feature, including the two links (which I read). I’m sorry he passed away, but what a career he had! From reading these two Post features, I’m tempted to say it’s kind of like reading something written by a combination of Don Rickles and Dr. Bombay (from ‘Bewitched’), if they had been writers. I also read ‘Heck on Wheels’ from late ’78; Baker’s one heck of an irreverent ‘memorial’ piece on Rockwell. I have to wonder what kind of clashes those two may have had at the Post or not. I couldn’t find anything online when Baker started there, or left the magazine; likely ’68. Rockwell left in mid-1963 for new opportunities at LOOK. Chances are extremely high they never met, especially if (I’m figuring) they worked freelance style, sending their respective works to the magazine where there just wouldn’t be any interaction.